Washy pastures need supplemented with dry matter, fiber, and energy. During the winter season most cattle are supplemented with dry forages, grains, and co-products. This ration is balanced and delivered to cattle. Then spring comes along and cattle are put out to grass. 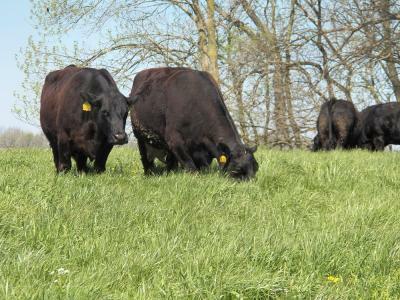 While green grass solves a lot of problems associated with winter feeding (manure, pen maintenance, calf health, and labor demands), it can pose nutritional challenges. Lush, spring forage has three major challenges when it comes to meeting cattle nutrition requirements. The first challenge is dry matter. Wet, washy grass can frequently be below 25% dry matter. This makes it hard for the cow to consume the enough dry matter (DM) to meet energy demands. The average of all pasture samples collected last Friday (April 29,2016) at the Orr Beef Research Center was 19.7% DM. This requires a lactating 1400lb. cow with average milk to consume 138 lbs. of fresh grass to meet her energy requirement. If that cow is a higher milking cow, she would need to eat 158 lbs. of fresh grass. In most cases, the cow fills up her rumen between 100 and 125 pounds. Physical fill can be a limiter on performance when grazing washy grass. The second challenge is high protein content of lush forages coupled with moderate energy content. Excess protein can be a problem when energy supply is short. When rumen microbes are presented a diet that is excess in protein and deficient in energy (low in carbs, fats, and sugars), deamination of protein occurs. This process results in production of ammonia and a carbon skeleton that can enter the Krebs cycle for energy production. Ammonia produced from this process crosses into the blood via the rumen epithelium. Ammonia is then converted to Urea by the liver and excreted in the urine. Excess protein has been well documented by the dairy industry as a detriment to reproductive performance. Some researchers argue excess protein is not a problem. I would suggest that producers must have adequate or above adequate energy in the ration before excess protein is ok. Even then, I would prefer the excess protein contain a good portion of rumen undegradable protein. I have observed cattle panting after being on lush, green grass for a few days. The panting was not due to heat stress either… the temperature was in the high 60's. These cattle were panting because they needed more oxygen. Red blood cells carry oxygen to the cells. They must also carry ammonia away from the cells to the liver. The panting I observed was due to too much ammonia in the system. I challenge you to watch your cattle on lush, green grass. The third challenge is fiber. The low fiber content of immature forages results in very high passage rates and an unsatisfied cow. It seems odd that cows would be unsatisfied while knee-deep in green grass. However, I have observed this several times. Cows will readily consume a low level of dry grass hay with lush pasture. This can help the DM problem and add fiber. While there are numerous solutions to remedy this short term problem, the main goal needs to be supplying cattle with a balanced ration. Unfortunately, lush pasture is not balanced. Some strategies may include delaying turnout until grass matures a bit more, leaving ample residual growth from the prior grazing season in pastures, supplying dry baled forage that is low or moderate in protein, but palatable (not alfalfa hay), supplementing with grains (not over 0.5% of body weight), or grazing only the top 1/3rd of the grass plant.